Warmer weather demands lighter footwear. And not just in weight and material, but in color too. Fall and winter are full of dark-as-night selvedge denim, blacks and grays, and deep rich colors. But these choices don’t hold up to the demands of warmer weather – both because they look out of place in the more colorful seasons but because functionally they take a sweltering situation and make it worse. Swampy summer boot feet = no bueno. So if you’re a Red Wing kind of guy and you’re starting to panic because the mercury is rising, fear not. I have a great option to slip in to replace them. Light suede is the perfect warmer month boot, most obviously because they’re a terrible winter boot. When you’re pounding through town with slush and snow on the ground, the last thing you want to wear is a pair of suede boots. Best case scenario the damp conditions just alter the color – worst case they get destroyed. But where it fails in snow, light suede shines when the sun is out. Since everything from our shirts, denim, and chinos start to transition to lighter, softer colors, your dark chunky Red Wings will begin to look out of place. 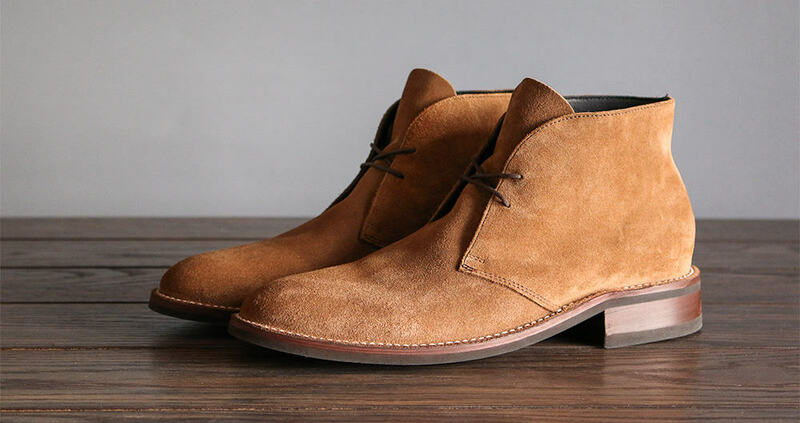 Lighter suede chukkas like these beautiful honey boots from Thursday Boot Company are the perfect middle ground between a dressier Wolverine Thousand Mile boot you’d wear in the fall and the casual Clarks Desert Boot. Made with Goodyear construction, glove leather interior, cork-bed midsoles and studded rubber outsoles, the Honey Scout is built to perform while staying comfortable for your active warm weather days. Just like a great boot from Red Wing, Wolverine or Chippewa, the lower, dressier profile and sole means a ton of versatility whether you’re heading for a casual cocktail or a big presentation with a client. Pair with light denim and tapered chinos in colors like blue, green, and medium gray. Watch out for your khaki colors – I’d only opt for those in the lighter shades, while these will look great in September with dark denim, dark tans and browns won’t mix as well. I don’t know how this site is funded, but a good amount of what’s published feels pretty advertorial. Usually, a certain amount of advertorial stuff is acceptable. Gotta pay the bills, after all. This post was really disappointing though. It really just feels like a thinly veiled and very transparent ad. I really don’t see what value it gives me. There was no how-to, style inspiration, photos of other shoes, or breakdown of dressier chukkas as a larger category. Primer has a lot of good content for young men that I generally like. I’m just saying that this isn’t one of those times and I hope that this is not representative of future content. Thanks for the good stuff that you guys do that has kept me coming back! Just coming from the other point-of-view, I don’t mind the single product coverage from time-to-time. Like when the hand held steamer was posted, I saw the site’s strong recommendation and the good price and bought it within minutes. I didn’t have to look through options, I saw the one that was good enough for Primer to write a post about, and I bought it. And on other sites like supercompressor, Cool Material, Kempt they let you know when a product comes out that should be on your radar, and I think this works the same way. Thanks Alex, so I appreciate the support and am glad you value them! I also do not mind the single product coverage. When I find something really great that I want to tell my friends about, I become an advertiser for the product. I see this as no different: just a guy telling his bros about a sweet new find that he recommends. In conjunction with the swath of past material on shoes, especially chukkas, I feel like this is just another stepping stone to greatness. Hi, thanks so much for the comment. This post was not funded or an advertisement in anyway. I came across them and bought them to see if I thought they’d be a good value for you guys. If you’re new to Primer, welcome! Since I started Primer in 2008, I’ve been extremely diligent about ensuring any type of sponsorship is clearly marked as an advertisement, and not in some little gray text at the bottom, but prominently where you can’t miss it. Reader trust is the ONLY thing that matters when you have a website, if you guys can’t trust the stuff I’m putting up here then why would you read it? As a reader of other websites, I completely understand the frustration behind your comment: So often you come across pretty much any other site and the sponsor disclosure is either small and hidden, passed off in the middle of a paragraph somewhere, or not disclosed at all. And I’m left with…"come on, this is clearly an ad, right?" And you can’t tell if what is being said about an item is true or paid for. It’s so important to me that not one of you ever feels that way about Primer. That’s why on sponsored posts I include a link to a page outlining how sponsorships workand how the content and control of them is all by Primer, not the sponsor. We do features on single products all the time, I love writing and doing photography for products that I come across that I think are worthy of your time and money. And they’re not sponsored, including a ton of them on boots. Like Red Wing Iron Ranger, Red Wing Beckman, Thorogood Moc Toe, Chippewa Apache, and Clarks Bushacre – none of those are sponsorships, they’re highlights of specific products I think you should know about. Thanks again for the comment and for reading. Andrew have you tried those boots in person? They look awesome and have been on my watch list for a while, but my one concern is that the heel looks pretty aggressive. Wonder how it looks in person though. Hey Adam, yep those are my boots, I took the pictures! Love them. The heel doesn’t seem aggressive in person. I have a pair in whiskey full grain leather, in fact I’m wearing them right now. I don’t feel like the heel is aggressive, but I may not fully understand your meaning. Funny thing, I originally bought they honey suede, but the sizing was weird and they didn’t have a replacement in suede in my size, so I went with the whiskey. I think they honey suede looks better, though I’m happy with pair I have. While I don’t have the chukkas (have been eyeing the chocolate brown suede version for a while now), I do have the Captain boots. They’re extremely comfortable! So much so that I actually *gasp* sold my 5 year old Alden Indys! Was really surprised when I came to that conclusion, but for the price and what you get, it’s a no brainer. Do not regret that decision at all after 8 months of solid wear. Great find Andrew. Those are some beautiful boots that fill a great role in these warmer times. I do share Adam’s concern about heel height, but that can be easily changed. Wish these had been around long enough to be on eBay already waiting for me to snag them at a much lower price! Hey Steven, It must just be the angle or something, the heels are a normal height. I don’t like high heels either, so I would’ve had a problem with them if they did. It’s funny that you posted this, because I’ve been eyeing Thursday’s Scout boot for the past month or so. All of their boots look good to me! Specifically, I’ve been trying to decide between their Honey Suede and their Dark Chocolate suede. James Bond definitely makes a good argument for the Dark Chocolate. I try to prioritize versatility when buying clothes, especially shoes – any opinions on whether the light or dark suede would be more versatile, easier to care for, etc.? Thanks! Nice! For versatility it’s hard to argue with dark since wear will be harder to see, but I’m not a big fan of dark brown suede unless it’s in a dress shoe for some reason. That’s snot a good reason though so if you like the chocolate I say go for it! I currently own a pair of Wolverine 1000 Mile Morley. Would these fill the same role? They’re rough out work boots, but under jeans/chinos they look very similar to this boot. I’ve removed the burnishing, so they’re just an even tan color. Yes! Those are sharp! How did you remove the burnishing? Good to hear. I’ve read in a lot of places that boots typically don’t get worn during the summer, but suede chukkas are typically ok? I just bought these a few months ago, and roughout leather and suede have a lot in common so I was hoping to be able to wear them. Of course because of the height of the boot it may be warmer, but wool socks can help. Was wondering if it were a faux paux or anything like that. I really didn’t want to buy another pair of shoes for summer. I removed the burnishing using a steel wire brush. The burnishing was smooth and I roughed it up with the brush and the darker areas came off. I then evened up the roughness with a regular horsehair brush. Nope, those will look great. Really cool you were able to get the burnishing out that way. Thanks for the advice! Attached is a photo of the before/after for anyone curious. Whoa! I’m honestly impressed, I never thought you’d be able to remove factory burnishing like that. Thanks for the photo. I to am impressed! 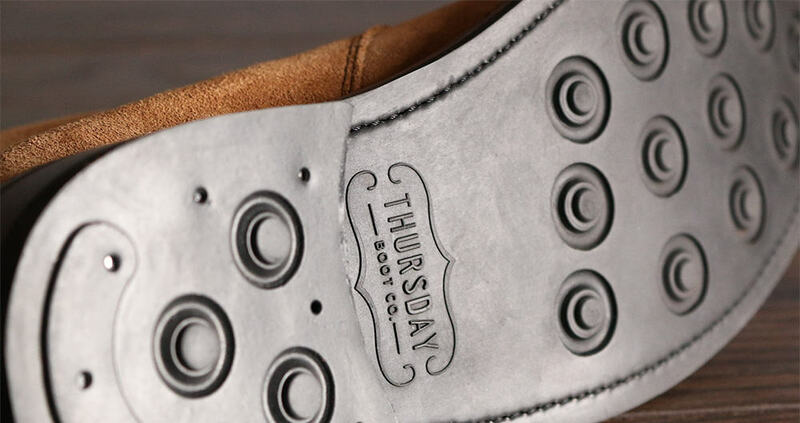 I hate factory burnishing… A lot of people say it just makes a shoe look more casual, but I think it looks tacky. I also admire your bravery for taking steel wire to such an expensive boot (at least usually expensive, not sure what price you got on it), I would have had a panic attack trying that. Thanks! I got it for $130+tax from Nordstrom Rack’s “Clear The Rack” a few months ago. I can’t take all of the credit, someone on Reddit had done it first and I just followed their steed. They literally wrote like 2 sentences on the matter but I wanted to try it. It was definitely nerve wracking and I procrastinated doing it..
After a certain point however I got tired of looking at the burnishing so I just went for it. I definitely didn’t wear these boots that much last winter since I bought the RW IRs in CRaT though. Was hoping to get more wear out of them if I could continue wearing them through spring/summer. I really want the new Red Wing Weekender in CRaT buy it’s always out of my size. 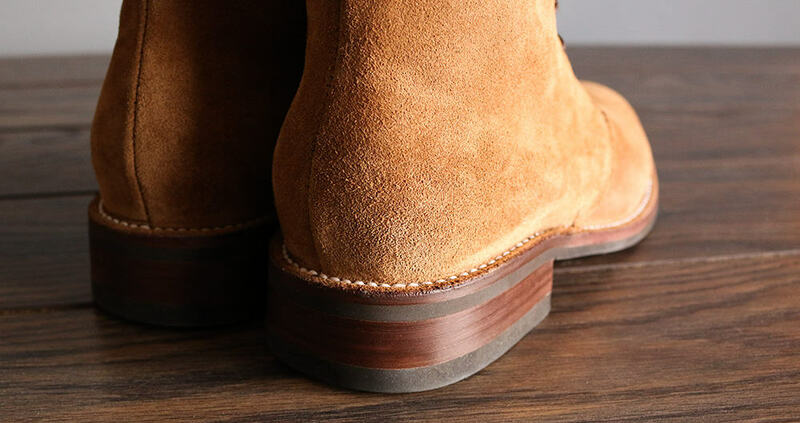 I have thought about getting it in the muleskinner which I would guess is like the leather used on your wolverines, but I want them to be my main “do-every-single-thing-in-them-all-year-round” boot, so I don’t know how well that suede-esque leather will look at the bar after a long day in damp grass or mud… where I know the CRaT will just keep looking better the more you abuse it. Yep, same leather. It’s “rough out” so visually just looks like a rougher suede, but is much more resilient than suede. Rough out leather is just that, leather. It’s leather on the inside. It’s not very waterproof. I wouldn’t get it wet regularly. Took it to a park on a dewey morning while walking through the grass and it got noticeably wet, almost stained looking. I immediately washed it and let it dry and it looked fine but I didn’t want the muck/water to sit. For an everyday boot I’d go for the normal leather offerings by RW or Wolverine. Hey Andrew, I spotted these in an ad on Amazon the other day and have been having a bit of a love affair with them since, thanks to this I’ll be picking up a pair ASAP.